was lucky enough to catch Iron Chef Marc Forgione right before he jetted off to Mexico for work, research, and hopefully a little relaxation. We met up at his namesake restaurant in NYC, where we discussed his extensive travels, his new restaurant at Revel in Atlantic City, his favorite produce item to combat steak house overload, and of course, his experiences on the Food Network’s hit show Iron Chef. EPS: So I know your dad is quite the famous chef, did you grow up cooking with him when you were little? Burke has competed on both Iron Chef and Top Chef, won countless awards and accolades, and has amassed quite the collection of restaurants that he owns and operates, from Las Vegas to Chicago to NYC to our very own New Jersey. Oh, and he writes cookbooks and dabbles in culinary gastronomy as well, branding GourmetPops (ready to serve cocktail lollipops) and Flavorsprays to enhance your cooking with less fat and more flavor. David C. Felton stands at the helm of the kitchen and farm at Ninety Acres Culinary Center, the restaurant situated on ninety gorgeous acres in Somerset County, New Jersey. 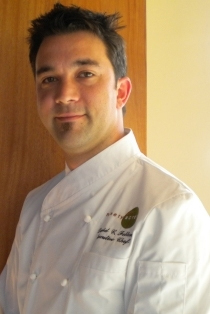 He attended Johnson and Wales University in Rhode Island, and after graduating with a degree in the Culinary Arts headed across the country, picking up flavors and techniques as he went along. After working his way around the country, and traveling around the world, he set his sights on New York City, working with top-notch chefs before assuming his executive chef position at Ninety Acres. Recently I had the opportunity to speak with Chef Felton about his inspiration in the kitchen, his passion for seasonal produce, and how he manages to integrate the kitchen and the farm into a seamlessly elegant restaurant. Elizabeth Palmer Starnes (EPS) Did you grow up cooking with your family? David C. Felton (DCF) I’ve been cooking with my mom as long as I can remember. She was, and still is one of the best cooks I know. My parents really don’t go out to eat dinner, because my mom always cooked a great meal at home every night. EPS. Do you have any particular culinary influences? DCF. My travels are my biggest inspiration. I’ve been in most of the United States, forty-seven of the fifty states, most of Europe, a lot of Central America. So I draw inspiration from cultural and regional cuisine, but then try to work New Jersey cuisine into it. EPS. Do you have a favorite style of American cooking? DCF. I am a huge barbeque fan. Eating it, making it myself, learning about the different schools of barbeque, like Carolina versus Texas versus Kansas City, so that’s kind of my cooking passion on the side. EPS. How do you coordinate the garden and menu at Ninety Acres? DCF. We work in conjunction with what's happening on the farm. This year, it’s been a crazy spring into a very early summer, so the strawberries showed up really early; you kind of play with that, since you have an idea of what’s happening on the farm a good two weeks before it happens. That’s what we base our menu around. It’s always changing and evolving with the farm. EPS. How often do you change your menu? DCF. The menu is constantly in flux. We don’t say: this is the summer menu, the produce comes and goes and that’s when the menu changes. We try and keep it consistent in terms of there's always a salmon dish, there's always a scallop dish, but it’s the garnishes that go with those dishes that change with the season. EPS. What produce are you most excited about for this summer? DCF. I love our access to herbs. We grow sixty different varieties of herbs in the garden here, and kinds of herbs that you’d never find anywhere else. The lemon basil is just starting to sprout. The flavor is so intense, its amazing. You're never going to go to the grocery store and buy lemon basil. So it’s the access to things like that, the varieties of basil, which we used a lot in the past, that went out of fashion and out of people’s gardens. EPS. Do you do research as to what kinds of produce you’d like to grow in the Ninety Acres garden? DCF. My executive sous chef and I work closely with the farm. People don’t realize how early it starts, but January/ February is when we’re placing our orders for the next growing season. So in the dead of winter we’re taking about summer tomato varieties, peas, herbs, and the like. EPS. That’s amazing! That takes so much planning and forethought- you really have to stay on top of it. DCF. It does, it’s a lot of work, but the rewards, I think, are great. Your end product speaks for itself. Things that you can't buy, we can grow here and use in our kitchen. EPS. You must be tempted to take all that great produce home! Do you have a garden at home as well? DCF. I do have a garden at home, I grow fig trees, I have a couple berry bushes, and I’m actually thinking of planting some apple trees this fall. I'm the crazy guy with tomato plants in his front yard. Instead of flowers I grow all kinds of perennial herbs. If I’m cooking at home, I just walk out to the front gardens and pick whatever I need. EPS. I’d want to be your neighbor! If you could open another restaurant anywhere in the world, where would it be? DCF. I love New Jersey, I’ll be honest. I was born in London, and moved here when I was eight, left again when I was eighteen and then came back in my thirties. It really has everything you could want. Its got great agriculture, you’re close to New York City, you can be in the mountains, and you can be on the beach all within a few hours. Anyone that has anything negative to say I’ve got ten times more positive things to say about New Jersey. EPS. That’s a great answer! And very true. So you grew up with British parents? Did they cook any British specialties for you growing up? DCF. No my mom is more of a French trained chef, so me and my mom compare recipes and notes and she's always calling me and asking if I’ve tried this or that. We just love food, so it’s not necessarily just a certain type of food that we cook, we just cook good food. Why label it? EPS. Growing up my dad would always cook the English classic roast beef and Yorkshire pudding for Christmas dinner. DCF. We do always cook roast beef and Yorkshire pudding for Christmas as well - there are some food traditions that you can’t get rid of. EPS. Do you like to cook at home? DCF. I absolutely do, I have a one-year-old son and we make all his food at home, so right now he's eating pasta primavera. And my wife, she loves to cook but gets nervous in the kitchen. But at least one day a week we try and cook something together so that she learns a new recipe. EPS. Do you plan on teaching your son how to cook? DCF. Yeah I’m going to teach my little guy how to cook but I don’t want him to follow in my footsteps. I want him to do whatever he wants to do. EPS. Where do you like to go out to eat in New Jersey and New York City? DCF. In New Jersey I love Arturo’s in Maplewood. New York City just has so much that it’s almost overwhelming. One of my favorites is DBGB, just such a great place to meet with friends. But I love Jean Gorges, I love Danielle, I recently got to go to 11 Madison Park, and that was wonderful. Then there are just some great little hole in the wall places that friends and family go to, that no one really knows about, but they have great food. EPS. So I’m sure you don’t have very much free time, but is there something you like to do on your day off? DCF. My wife and I love to kayak. Around here we’ll go down to Cheesequake National Park, or just wherever we can. It’s just nice to be out on the water, its very relaxing, good exercise. EPS. What would you want your last meal be? DCF. My last meal; bit of a depressing thought. I think my last meal, the actual food I don’t know what it would be but I would want to eat lunch at the Jean Gorges restaurant. I think the best bargain in New York City is lunch, and you can lave a nice leisurely lunch, finish up, then usually we’ll take a late reservation for lunch and then go meet some friends for cheese at Artisanal at the end of it and then call it a day. EPS. Are there any special events coming up this summer at Ninety Acres? DCF: We do walk around wine tastings, coming up we have “Drink Pink,” where we focus on pink wines with a farmer’s lunch, and we do them once a month during June, July, and August. Then in September we do a lamb roast, pig roast, lots of great things. According to Chef David Drake, there are two kinds of chefs: those who grew up on the apron strings of their mother and grandmother, comfortable in the kitchen from their earliest memories, and those who come from families with terrible cooks. Drake comes from the latter type. Growing up in rural Pennsylvania, Drake’s mother cooked up bland mainstays like tuna casserole, turning Drake into a picky eater who couldn’t stand fish (now one of his signature items). I recently had the opportunity to chat with Chef James Laird, owner of Restaurant Serenade in Chatham. We spoke about his journey to becoming one of New Jersey’s most acclaimed chefs, from sweeping the parking lot at a New Jersey casual eatery to receiving the Robert Mondavi Culinary Award of Excellence. Read on to learn about James’ hobbies for stress relief, his most memorable meals, and of course, Modernist Cuisine. MK: Talk about you’re journey to becoming such a respected, acclaimed chef. What inspired and influenced you along the way? JL: It started when my sister worked at a restaurant in Middlesex called the Round-Up, and since I was little I always wanted to make money. I asked the owner if I could work there, but he told me I was too young to do anything, so he let me clean the parking lot. And that was my job: to sweep the stones into the potholes and clean up the cigarette butts. But by 16 I had the key to the restaurant. I wanted to do more, so then I went to a fancy restaurant in town, called the Boca, a local Italian Restaurant and worked there as a bus boy. I saw the cooks working in the kitchen and they let me come in on my free time. One of the chefs there was a CIA (Culinary Institute of America) graduate who taught me after school and introduced me to all the chefs. The Chef would take me to the city to all the finest restaurants; I was 15 or 16 and so impressionable. He wore nice clothes, had nice cars, people respected him. I wasn’t very rich, so I saw this as a way to grow and I liked it. Anything you learn when you’re 16 or 17 is so much easier than when you’re 30 or 40; basic skills like being organized and time management were things I learned early in life that help me to this day. At 18 I went to school at CIA and the rest is history. I graduated school and worked in the city for five years. I worked in restaurants all around the world. But it was always my goal to own my own restaurant. Chef Humberto Campos, "Simple, But Inspiring"
Chef Humberto Campos in the dining room at Lorena'sThe first time walked into Lorena's in Maplewood, I felt as if I were walking into someone's home; kindness at the door, and great aromas from the kitchen. Lorena's is owned and operated by Chef Humberto Campos and his wife, namesake for the French eatery, Lorena. Chef Humberto's cooking is as initimate as the space he serves it in. And though intimate, the fare is unwaveringly upscale and masterfully executed. There's a bit of a coincidence to this story as well. Lorena's is located in the former location of Jocelyn's, another acclaimed NJ restaurant that was owned by Chef Mitchell Altholz, who also named it after his wife, Jocelyn. But on with the story! I recently spoke with Chef Campos about his his journey to celebrity chef status. MK: How did you develop your passion for cooking? It’s funny; I tried pretty much everything else. I worked in retail, construction, and a bank, but nothing really spoke to me. I got bored very easily.